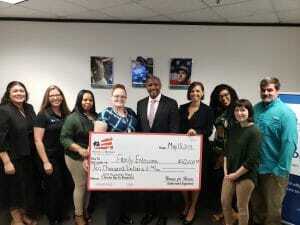 In honor of Military Appreciation Month and Armed Forces Day, Homes for Heroes grows its Circle of Giving through the Homes for Heroes Foundation with a $50,000 Grant to National Coalition of Homeless Veterans Nonprofits. 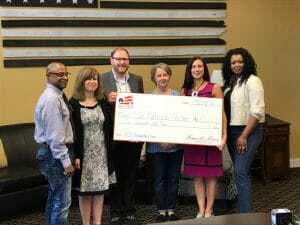 The Homes for Heroes Foundation presented five checks for $10,000 each to National Coalition of Homeless Veterans’ nonprofit organizations across the nation who serve homeless veterans. The National Coalition for Homeless Veterans (NCHV), a 501(c)(3) nonprofit organization, is a network of community-based service providers, who work with local, state and federal agencies to provide access to essential everyday needs and emergency services to hundreds of thousands of homeless veterans each year. The NCHV is the only national organization that is dedicated solely to improving the future for these veterans by helping them regain control of their lives and once again enjoy everything they fought to preserve. The NCHV is recognized as the nation’s leading authority on homelessness among veterans by the U.S. government, the VA, DOL, the Department of Housing and Urban Development, and the Federal Emergency Management Agency. 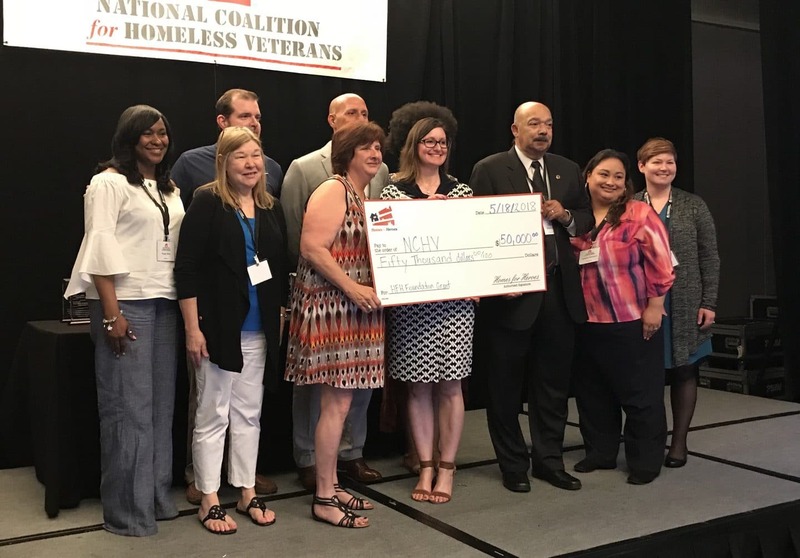 Over 2,100 community-based homeless veteran service providers across the United States have partnered with the NCHV to successfully reach and help homeless veterans. This network of nonprofit organizations provide secure, safe, clean housing that offers a supportive environment free of drugs and alcohol necessary for veterans to become self-dependent to build a life of their own. Part of the success behind these community-based programs are their ability to effectively reach homeless veterans in their community, while still working collectively with federal, state and local government agencies, other homeless providers, and veteran service organizations. Veterans who take advantage of and engage with these programs increase their chances of becoming self-dependent citizens. On May 18th, 2018, five organizations were presented with a check from Homes for Heroes Specialists on behalf of the Homes for Heroes Foundation. Homes for Heroes Specialist, Chris Brickman, presents Endeavors with a $10,000 grant. Endeavors provides veterans with comprehensive, effective, and innovative services that empower people to build better lives for themselves, their families, and their communities. Their services include case management, housing stabilization and homeless prevention services that are provided to over 4,000 veteran households each year. US Air Force veteran and Hurricane Relief survivor, Maurice “Max” is a great example of the success of the Endeavors program. When Max came across Endeavors, he was living in his truck after he was evicted from his apartment. After going through the Endeavors Veteran Navigator Program, he was able to find a job and an apartment. Eventually Max started his own business and enrolled in an entrepreneurship program. Max’s commitment to improving his life and future, along with the help of Endeavors turned his life around. 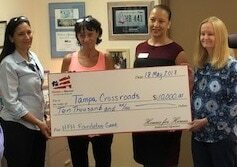 Homes for Heroes Specialist, Renee Thompson, presents Tampa Crossroads with a $10,000 grant. 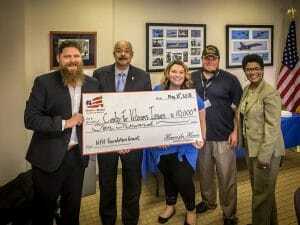 Homes for Heroes Specialist, Patrick Johnson, presents Center for Veteran Issues with a $10,000 grant. The Center for Veterans Issues serves men and women of our armed forces who find themselves in need after returning to civilian life. By providing them with information, resources, identification of funding, technical assistance and organizational development to veteran service organizations, homeless veterans turn to CVI for transitional housing and many other services to help them transition back into the community.The grant will allow CVI to take a proactive approach to fighting homelessness among the veteran community. According to CVI’s President and CEO, Robert Cocroft, the center does not have “enough funding is in the area of prevention. To catch a veteran before they become homeless.” This grant will go directly to providing that much needed aid. St. Patrick Center provides homeless veterans and veterans at risk of becoming homeless opportunities to become self-sufficient with dignity. Veterans going through St. Patrick create a sustainable positive change in their lives through safe and affordable housing, sound mental and physical health, and employment and financial stability. “St. Patrick Center is a hand UP, not a hand out. We don’t enable homelessness. We assist people with changing their lives.” US Army veteran, Jeffery Lewis worked with the St. Patrick Center to get back on his feet when he lost his job and became homeless. Lewis says, “It is more than just having a roof over your head. He said the center puts you in contact with other agencies to help land a job.“ The grant will be used to help the more than 600 homeless veterans living in Missouri. Homes for Heroes Specialist, Gianni Cerretani, presents HOPE Atlanta with a $10,000 grant. Each year, HOPE Atlanta helps over 6,300 homeless people get of the street, like Vietnam War veteran, Steve Arline. It’s been a roller coaster for me. I’ve been up, I’ve been down. But now I am stable. I have furniture. I have an apartment. Life is good now”, says Steve Arline. The $10,000 grant will go towards their Rapid Rehousing Program, which helps place veterans in an apartment for up to six months, while they find employment or an income stream. NCHV’s annual conference was held on May 31st, 2018 to continue identifying proven strategies and policies to assist our veterans in need. The conference brought together community-based nonprofit providers, federal agency staff, and thought leaders from both the public and private sectors. 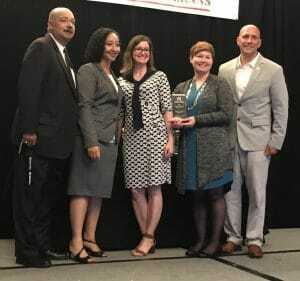 NCHV awarded the Homes for Heroes Foundation its 2018 Outstanding Corporate Partner Award, in recognition of its dedicated support to the campaign to end veteran homelessness in the United States. For those that serve and sacrifice so much to protect this nation’s freedom, Homes for Heroes is grateful to give back and serve the veteran community. This Foundation grant is just one way that we can do so. I would like to submit a Nonprofit organization that is helping homeless veterans in Omaha NE. They are in need of funds to move into a larger facility. The group is called Moving Veterans Forward. How do I go about submitting them to receive a grant?